A delicious and easy to prepare summer side dish. Heat a frying pan and cook the bacon lardons in a little oil until crispy. Place the baby potatoes in a pot covered with water and a pinch of salt. Bring to boil and simmer for 8-10 minutes until just tender. Remove from the heat and drain, allow them to cool in a colander. Once the potatoes have cooled down, slice them into quarters. 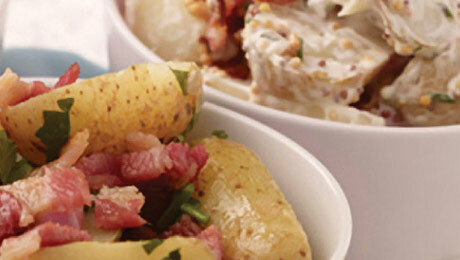 Then add the bacon lardons, onion, chopped parsley, wholegrain mustard and mayonnaise. Mix well and season as required. How much mustard is required? Hi Louise, 1 tsp of SuperValu mustard is required. Hope that helps!